My Dog “Just” Pooped on the Carpet – in Spanish. just — justo, sólo, solamente. Note: Just so you know, sólo is an adverb meaning “only,” “solely” or “just”– the same as solamente. As a matter of fact, sólo and solamente can be used interchangeably. A speaker can decide which sounds better in any their sentence. On the contrary, solo without an accent mark is an adjective meaning “alone” or “on one’s own”. I’m just sitting here. That’s all. Sólo estoy sentado aquí. Es todo. It’s located just down the street. Está ubicado justo al final de la calle. The runner completed the marathon in just three hours. El corredor terminó la maratón en sólo tres horas. In Spanish, we use the properly conjugated present tense form of acabar + de + the infinitive form of the verb (-ar, -er, -ir). This is expressed in English in the past tense. It may take some getting used to, but this phrasal formula is very useful in daily Spanish. My dad just took a bath. Mi papá acaba de bañarse. My dog just pooped on the carpet. Gross. Mi perro acaba de cagarse en la alfombra. Qué asco. The Korean lady has just finished making some tasty soup. La señora coreana acaba de preparar una sopa deliciosa. I was in Quito, Ecuador for a week. I just got back yesterday. Estuve en Quito, Ecuador durante una semana. Acabo de regresar ayer. This enjoyable Spanish stuff is from the upcoming book, Real Life Spanish Phrases. Categories: Aprender Inglés, Spanish, Tips, tricks and techniques | Permalink. Beginning Thursday, June 1, 2017, my book Ripping Apart The Spanish Language: Ser & Estar will be free… for five days. Therefore, it is my mission to change this. It has been my purpose to write a book that gives you exactly what you need and ends the quest for that missing information in your Spanish learning journey. 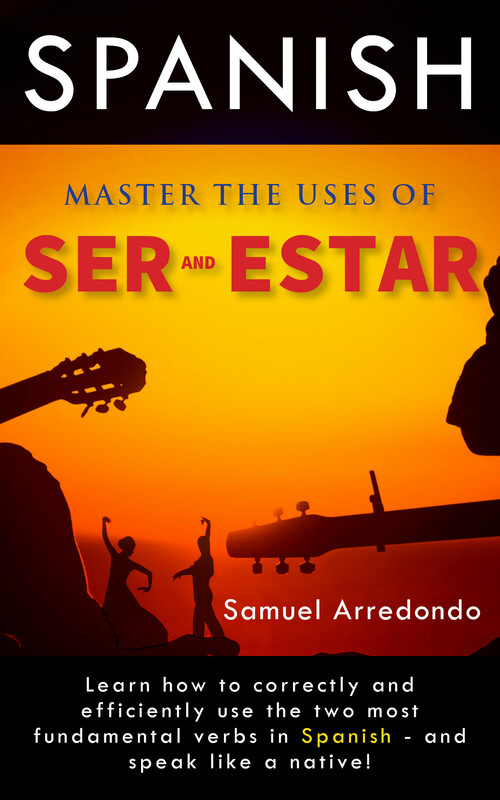 This book will take you through many uses of Ser and Estar individually, explaining just how it works, using lots of examples and providing lots of exercises to “make it stick”. By the end of this book, I am confident that you will have mastered the usages of Ser and Estar and will be ready to go out and speak like you know what you’re doing. Categories: Book Review, Spanish, Tips, tricks and techniques | Tags: estar, fluency, grammer, ser, verbs | Permalink. There are all kinds of language learners in the world. The kinds that “speak from day one”. The ones that study in schools for two or three years, then take a trip to Latin America or Spain and see if they can remember how to order some paella. There are those that become introverted (if they weren’t that way already) and study for hours per day until they get a substantial amount of vocabulary, grammar, and pronunciation practice under their belt to hold a decent conversation, before going out and trying out their skills with real people, whether in person or on Skype. Regardless of what kind of student you may be, there is one thing that all of us will go through, and that’s trying to get over the mountain of beginner status and flipping over the top into intermediate status and ultimately, advanced status. The famed light at the end of the tunnel, except there is no end to this tunnel, because language learning never really ends, does it? If you are someone that is studying Spanish, for example, there are certain things that you can do to get over the beginner hump. And that is to learn some real-life Spanish phrases, slang and idiomatic expressions to accomplish your goal. So, you wanna sound like a native? Then learn the way natives speak, and speak like them. She gave it to us of her own accord. Nos lo dio de propia voluntad. Look at him. He’s all scared. Pamela gets along with her mother-in-law. Pamela se lleva bien con su suegra. Carlos and Rachel se llevan como perro y gato. I always go along with my mom because I don’t like to argue with her. Siempre le llevo la corriente a mi mamá porque no me gusta discutir con ella. The little boy spilled the beans. El niño lo descubrió todo. It beats me why they do that. No tengo ni idea por qué hacen eso. I can’t pay. I’m broke. No puedo pagar. Estoy chiro. Tell that guy to shut his mouth. Say hi to all the guys at the meeting. Saluda a toda la gente de la reunión. Keep studying, keep reading, keep listening, and keep speaking. Today I published a novelette called OF ALL PLACES. What happens when the chosen ones, having survived a crash landing and now suffering the after-effects of the injections administered by the astrophysicists back home, take on a journey through the untraveled, dusty, rocky terrain of Kepler, en route to the oasis that was promised to them? For Tess Hadfield, a fist-clenching, tomboy from New York, and Gunner McAuliffe, a jokester ex-military school student from Glass Wire Point, New California, this is just the beginning. Categories: Aprender Inglés, Book Review, English Learning | Permalink. There are myriads of books out there on Spanish learning. Too many. But as we browse through the rows and rows of these books at Barnes & Noble, as we peruse through pages and pages on Amazon.com, we don’t always find what we’re looking for. What is it, exactly, that you would love to see in a Spanish learning book. What would really help you out? For example, would you like to see a book on reflexive verbs, pronoun usage, slang words and phrases, difference in language between Spain and Mexico, how phrasal verbs translate into Spanish, Spanish dialogue, etc.? Would you want a book that is written to teach you a specific problem area of yours? I’d like to get your input for my next project. My goal has been to help other people learn this beautiful language! Please comment below and let me know what you think. I’d love to help.